Cole Skinner was hanging from a wall above an abandoned quarry when he heard a car pull up. He and his friends bolted, racing along a narrow path on the quarry’s edge and hopping over a barbed-wire fence to exit the grounds. Adolescents do take more risks than adults, and the consequences can include injury, death, run-ins with the law and even long-term health problems. But lab studies in the past decade have revealed layers of nuance in how young people assess risks. In some situations, teenagers can be more risk-averse than their older peers. And they navigate a broader range of risks than has typically been considered in the lab, including social risks and positive risks—such as trying out for a sports team. These types of behaviour seem to have different effects on the brain. How adolescents interact with risk is important. Work on the neural underpinnings of risky behaviour can inform guidelines and laws for teens who drive, for example, or the punishments they receive for violent crimes. Understanding how the teenage brain evaluates risk could even reveal predictors of mental-health conditions such as schizophrenia and depression, which often emerge in adolescence. Adolescence is a perilous period. The death rate among 15- to 19-year-olds worldwide is about 35 percent higher than that among 10- to 14-year-olds. And risky behaviours are linked to many of the major threats to life during this time (see graphic below). 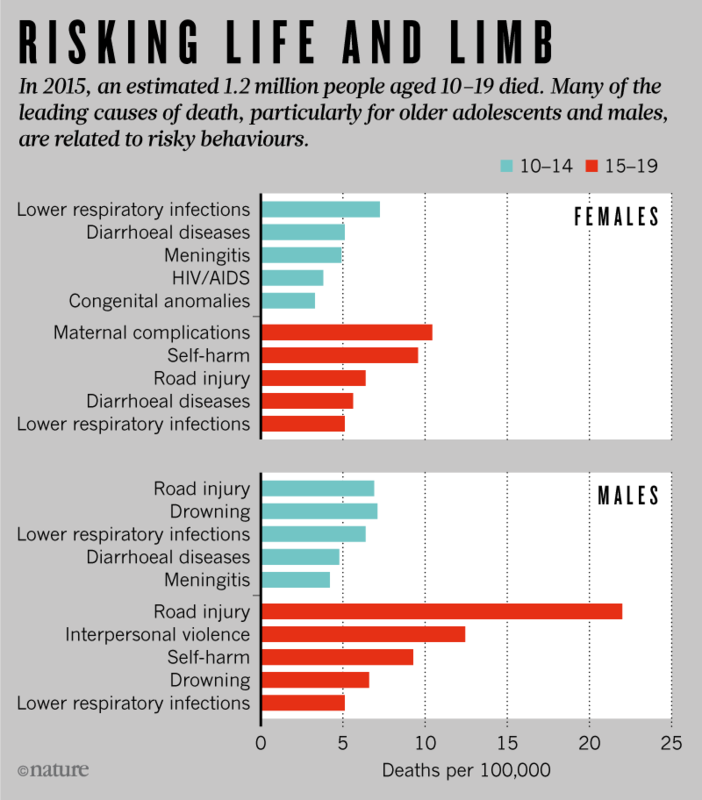 Road injuries are the biggest cause of death for adolescents globally. Self-harm and other forms of violence also rank highly. Plus, some practices that can lead to poor health in adulthood—such as use of tobacco or alcohol, or sedentary lifestyles—often stem from poor choices made in the teenage years. So, risky behaviour has been a preoccupation for scientists. Early theories focused on a perceived imbalance in the developing brain. Areas linked with impulsivity and heightened sensitivity to reward, especially in the social realm, get an early boost in activity, whereas those governing cognitive processes such as working memory develop smoothly throughout adolescence. Neuroscientists likened the emerging picture of the teenage brain to that of a car with a revving accelerator and faulty brakes. This fit the developmental data, but not the fact that many teenagers show no proclivity for risk-taking, says Ted Satterthwaite, a psychiatrist and neuroimaging researcher at the University of Pennsylvania in Philadelphia. A 2016 survey of more than 45,000 US teenagers found that 61 percent had not tried cigarettes by age 17–18, for example; some 29 percent had never drunk alcohol. Most neuroscientists now acknowledge that neural systems developing at different rates do not mean that the brain is unbalanced. “It’s a vulnerable period, but it’s not vulnerable just because there’s something going wrong with their brains,” says Satterthwaite. In recent years, studies have begun to characterize how social elements influence risk. In 2009, Laurence Steinberg, a psychologist at Temple University in Philadelphia, got teenagers to lie in a functional magnetic resonance imaging (fMRI) scanner and play “the chicken game”—a video game in which they drive a car, passing through an implausible 20 traffic lights in 6 minutes. As the first lights change to amber, some teenagers choose to carry on; others wait for green. Sometimes speeding ahead pays off, but sometimes the car gets hit. When teenagers played this game alone, they took risks at about the same frequency as adult players. But when Steinberg told the adolescents that their friends were watching from an adjacent room, they took significantly more risks. In a similar study by Telzer and her colleagues, teenagers took fewer risks when they were told that their mothers were watching. The scanner revealed greater activation in reward-sensitive brain regions, such as the ventral striatum, with the friend-influenced risky behaviours. Meanwhile, the mothers’ presence correlated with activation in the prefrontal cortex, an area known to be involved in cognitive control. Neuroscientists have used this game to test how a teenager’s propensity to take risks can depend on their social stature. In one study, a team at the University of Oregon in Eugene got adolescents to play it in a scanner after hearing that two other teenagers were watching. Then the researchers got the participants to play another video game, in which they were excluded from throwing and catching a ball with the same peers. When they returned to the driving game after experiencing social exclusion, adolescents who said they were sensitive to peer influence took significantly more risks. Those who demonstrated this pattern also showed greater activation in a brain area involved in modelling the thoughts of others, the temporoparietal junction. In another study, Telzer and her colleagues found that teenagers who were more socially excluded or victimized took more risks. The work is part of a drive to understand who is most vulnerable. “If we know the context under which teens smoke or make good or bad decisions, we can push them into the contexts that are more positive,” says Telzer. Peers can have positive effects, too. In a 2014 study, teenagers were asked to donate or keep money in an online game, supposedly watched by ten peers. If a participant made a donation and their peers approved—denoted by a “thumbs up” icon—the participant made more donations during the game. (Although the opposite is also true.) “There’s an assumption that teenagers’ friends are a monolithic negative influence,” says Telzer. The real picture is more complex. Interestingly, the same brain systems that mediate unhealthy risk-taking also seem to help teenagers to take positive risks. Activity in the ventral striatum, particularly rising numbers of dopamine receptors, has been linked to the greater sensitivity that teenagers feel to rewards for positive as well as perilous behaviours. Telzer’s studies suggest that teenagers who show heightened ventral striatum activity when making decisions that help others, such as donating money, take fewer risks in the long term and have a lower risk of depression as adults. “There’s very much a yin and yang to this,” says Dahl. There are limitations to these lab-based studies; it’s hard to reproduce the social whirl of teenage life in a scanner, says Galván. “How do we emulate what’s going on on Saturday night in a cold lab on a Tuesday afternoon?” she asks. The studies are more likely to capture a teenager’s inclination for risk than the likelihood of real-world risk-taking, Galván says. The other problem is that the average teenager in a study is only moderately likely to take risks. “Most of what we know about adolescent risk-taking is actually derived from relatively normative samples,” says Telzer, “not adolescents engaging in high levels of risk-taking behaviour.” Dangerous risk-taking could be confined to a small proportion of teenagers, and there is evidence that they process risk very differently from their peers. Telzer ran an as-yet-unpublished study in 2015 with adolescents who had been expelled from a school for serious offences. Her team asked them to lie in a scanner and push a button when they saw letters on a screen, but not if the screen displayed an X. Images with social significance—positive pictures such as teenagers laughing or playing games on a beach, and negative ones including a group ganging up on someone—also appeared on screen. Most teenagers were worse at the button-pressing task when the images were positive; their cognitive control was overridden by the rewarding picture. Activity in the ventral striatum went up in tandem. But among the expelled or suspended students, it was the aversive pictures that impaired performance. The teenagers’ lack of control, Telzer says, seems to come from a different type of reaction to social stimuli. Research on risk-taking has begun to inform the US justice system. Authorities are taking into account, for example, the factors that might impair a teenager’s self-control. Studies show that in emotionally neutral situations, young adults perform cognitive tasks just as well as older adults. But when the situation is emotionally charged, their performance drops off. This and other work could suggest that crimes in emotionally “cold” situations should be considered differently from those in which “hot,” or emotionally led, decision-making takes over. Similar work could provide ways of pinpointing teenagers at high risk of doing something dangerous. Steinberg testified in five court cases last year concerning criminal sentences for adolescents. After hearing his evidence on how decision-making in teens is influenced by emotion, a Kentucky court last year decided to raise to 21 the age at which individuals could be given the death penalty. And the evidence has also been enlisted in arguments against mandatory life sentences without parole for offenders under 21. The data are also too noisy for diagnosis, but Satterthwaite is tantalized by evidence that the young brain’s response to risk might reveal early symptoms of depression or anxiety. He would like to see research get to the point at which it could guide clinical treatment. “The idea that you can come see me with a life-threatening condition, and leave with no diagnostic test, no imaging, no lab test—that’s medieval,” he says. The broader research on adolescent risk is already helping to minimize dangerous behaviour in daily life. For instance, adolescents who don’t get enough sleep are more prone to a host of risk-taking behaviours, such as smoking and sexual activity. Dozens of studies on the effects of increasing sleep by delaying school start times—a move endorsed by bodies such as the US Centers for Disease Control and Prevention and the American Academy of Pediatrics—suggest that many of these problems, including risky behaviours, improve when schools start later. The academy recommends a start time of 8:30 or later; hundreds of schools in the United States have delayed their first bell, but in 2014 the median start time for middle school was still 8:00. Steinberg has advocated limiting exposure to risk in the first place, for example by raising the minimum age for buying tobacco to 21 or prohibiting alcohol sales within 300 metres of schools. This is likely to work better than approaches based on informing students about risks, he says. Other policies aim to take away the opportunity for dangerous behaviour. Graduated-licensing schemes in Australia, New Zealand, Northern Ireland and the United States compel young drivers to build up experience before they are allowed to drive with only teenage passengers. Such programmes have been shown to reduce casualties among young drivers. This article is reproduced with permission and was first published on February 21, 2018. Kerri Smith works for Nature magazine.